If I had to pick a stone that attracts me to rings more than any other, it would have to be turquoise. Maybe it’s because my favorite colors are cooler, or maybe it’s the understated beauty and sheen of an opaque stone…Whatever the reason, I’m smitten. I love larger stones, but I’m also fascinated by tiny seed beads of turquoise intricately set in Victorian rings that are well over 100 years old. In effect, I own more turquoise rings than any other gemstone. 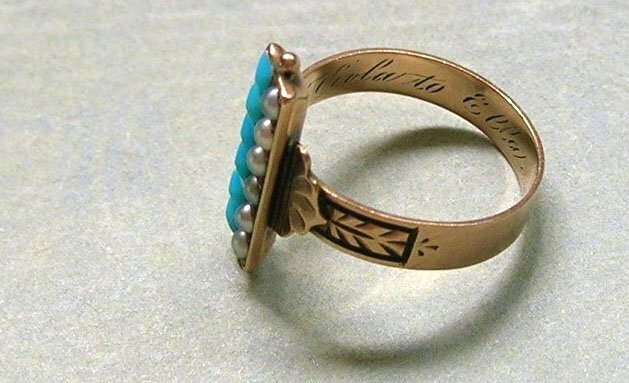 Some of the first antique rings I added to my personal collection were turquoise. First, because they were my favorite. And second, because they were actually affordable for an antique jewelry collector just starting out. The best part for me? Old natural turquoise that has been oiled can change color over time. So instead of a uniform row of monotone stones, some stones show their age by turning a deeper shade of green. Also, most antique turquoise doesn’t have the same veining as dyed turquoise from the South West (which I don’t really care for). As I get back into blogging for Ageless Heirlooms, I plan on curating more for my readers, not just from my collection but from a multitude of sources. I spend hours browsing antique shops, both online and in person. To me, that’s a well spent Saturday. So, I want to share all of my favorite one of a kind pieces here. Let me know if you think this is a good idea. Antique Jewelry Tip: Beware of simulated turquoise in antique rings. This material is essentially turquoise colored glass. One way to tell is when there are multiple smaller turquoise stones. Simulated turquoise stones tend to look identical to one another and have a lighter overall tone. These turquoise dupes also tend to be set in 10k gold or less. The second ring to make my list is comprised of simulated turquoise, making it a great option for anyone on a budget. Simulated turquoise is great, so long as the dealer discloses it! 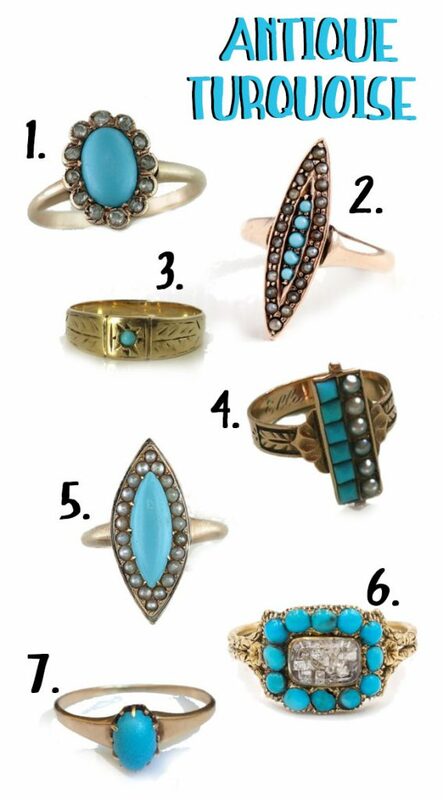 Without further ado, my current top antique turquoise rings (that are, for the moment, still available). The #1 spot is certainly my favorite. Which is yours? this ring is so beautiful and design are nice and the article which wrote by LAUREN THOMANN is good.